Creating a new design for a small sub-urban garden is an interesting but exciting challenge. Putting things in the correct order and position is very important, for example, design and locate the patio where it is most likely to be used and bearing in mind time of day and ideally in a position which enjoys a sunny aspect. Most gardens have garden sheds which often intrude not just the view but the overall atmosphere. Again, locate garden sheds in a position which is less intrusive, use planting to help screen but also colour to provide a softer ambiance. 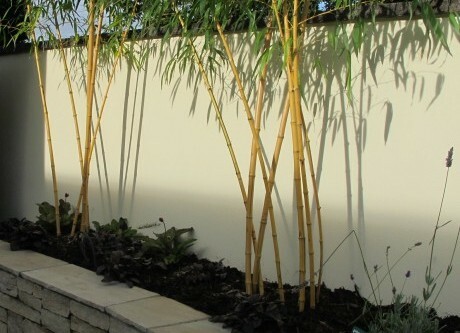 Bland ugly boundary walls must be tackled, best done (budget permitting) with applying a render and for an even more fantastic result add a painted finish in your preferred colour to create a perfect ‘outdoor room’ look. Once the structure has been re-defined, determining the design and finishes for remaining elements such as pathway, lawn, borders are more easily resolved. By virtue of the compact size, small gardens are generally much more visible, and just like the old saying “good goods come in small parcels”, similarly designing and landscaping smaller gardens present various challenges if they are to be transformed and to excite the senses. Careful and imaginative consideration can combine effectively to create exciting results and a garden which is readily appealing, practical to use and a pleasure to enjoy.